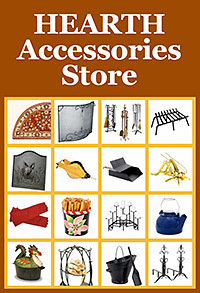 Whether you are looking for wood burning stoves, pellet stoves, or gas stoves, Yankee Doodle has the perfect product. 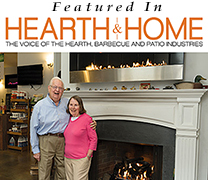 Known as Fairfield County’s favorite hearth store, we serve clients in towns like Wilton, Norwalk, New Canaan, South Salem NY, Easton, Brookfield, Bethel, Danbury, Bedford NY, and many other communities in Fairfield, Westchester, and Litchfield County. Today’s free-standing stoves combine innovative technology with exquisite design. Unlike old fashioned models, contemporary stoves are energy efficient and clean burning in timeless styles to complement your home décor. If you are looking for an alternative heating appliance to help you cut costs during the long, cold winter months, you can’t go wrong with a wood, pellet or gas stove. Here at Yankee Doodle, Inc. Stove & Fireplace Center, we carry stoves with cutting-edge technology and exquisite craftsmanship from leading brands: Avalon, Lopi, Jotul, and Enerzone. Whether you prefer a sleek, modern stove or a classic stove with ornate finishes, we have one for you. Along with the diversity of styles available, each model boasts attractive amenities from remote control operation or thermostat control to antique brick paneling kits or accent lighting. Visit our showroom right off scenic Route 7 in Wilton, CT Fairfield County to compare and contrast the benefits of each model. If you need further assistance, our hearth experts can visit your home to help recommend the perfect heating stove for your heating requirements and lifestyle. Many New England homeowners are attracted to the traditional appeal and environmentally friendly impact of wood burning stoves. Along with being a renewable resource, wood is considered carbon neutral. The re-burn system responsible for wood burning stoves’ high energy efficiency burns up left over gases and particles from the combustion process. This ensures that they produce low emissions of harmful gases. Due to this innovative design, contemporary wood burning stoves now meet or exceed the emission requirements of the Environmental Protection Agency (EPA). You can feel good about your environmental impact while enjoying the ambiance created by burning logs in your wood burning stove. The unmatched convenience, attractive features and easy maintenance of gas stoves makes these heating appliances hard to pass up. You can ignite your gas stove with the flip of a switch or push of a button. Some models will allow you to control the height of the flames, heat output and more with a remote control. 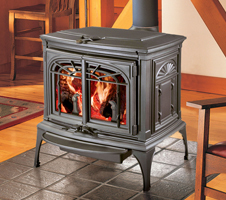 Another benefit of gas stoves is that they can be installed in almost any room because they require a simpler venting system than wood stoves; some models are even vent-free. Whether you want to zone heat a single room or heat up to 2,000 square feet, we have the find the right gas model for you with a long list of extra features. Find out more about the perks of choosing a gas stove to heat your home or view our collection to see for yourself! 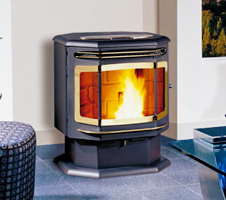 A pellet stove is the perfect choice if you are looking for a heating alternative that is environmentally friendly and convenient. Pellets are a renewable, recycled fuel made from wood scraps, sawdust and bark. Their low moisture content allows them to burn more efficiently than wood logs which is why these stoves surpass the energy efficiency of wood burning stoves. You are spared the hassle of splitting wood and waiting for it to season. 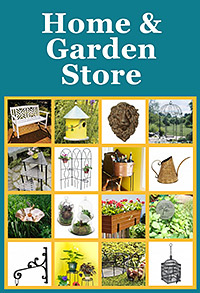 Pellets are available in large bags that can be used immediately. These stoves are uniquely designed to hold pellets in a hopper that automatically dispenses them into the fire as needed. By setting the rate the pellets are dispensed, you are able to control the amount of heat produced by your stove. Some models come with a thermostat to simplify the process for you. 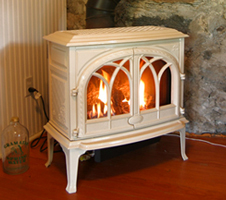 Our selection of EPA approved pellet stoves offer a long list of amenities. Stop by to see them in action or learn more.